He's an overweight, overtired senator in the final week before the elections. In a suicidal depression he makes a pact with the insurance special-interest lobbyist (Sorvino) and organises a little 'research project' (his own murder). 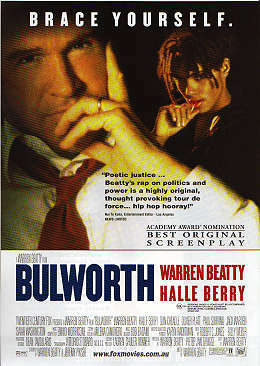 But a funny thing happened on the way to Bulworth's (Beatty) demise -- he went to church and found, instead of religion, TRUTH. And the truth, wrapped up in rap, is a drug. 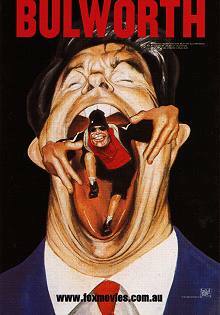 Suddenly, free from fear, no longer currying favour from the privileged few, Bulworth discovers his voice. He raps his way from a smart suit to sweats and a woolen cap, with his newfound backup singers in tow, including the lovely, activist-educated Nina (Halle Berry). Will he live, or die? Will his message be heard? Will it make a difference? Only you can say, because like many other Beatty films, this is one makes an argument. His argument against prejudices is compelling, and deliciously wrapped in f**king language. I admit to enjoying the idea of those whimpy, lace-underwear clad Mr Puritans who bleep and squelch our television soundtracks trying to censor this film. On the other hand, I wish I could remember which reviewer pointed out the numerous films with saggy, baggy men and healthy, young fertile women. The film would have been stronger, if it had been purer -- not watered down by an old man's fantasies. Mind you, I had to admire Beatty's willingness to eschew gorgeous and play flab. But, mate, I f**ckin' enjoyed it.